Google, Novartis, California University and partners are developing smart contact lens for diagnostic purposes1. Project was started in 2015, and the clinical studies are expected to be finished in 2016. The idea for the project comes from Sensimed company who first designed sensor contact lens for monitoring intraocular pressure in glaucoma patients2,5. However, this project has a wide range of possible applications in diagnosis and it could be used for measuring blood glucose levels in diabetic patients, correcting presbyopia or detecting environment allergens1,3,4. Also, this contact lens could measure a wide range of carrier's biological data such as body temperature, alcohol levels etc., primarily analyzing physiological characteristics of tears4. Lens could be integrated with smartphones or computers for constant monitoring of physiological markers and data. Project is ecologically friendly since the lens are solar powered. 1. Google, Novartis Smart Lens To Be Ready For Human Trials In 2016 by Jof Enriquez, September 2015. 4. By Cadie Thompson, October 2015. A new study has shed light on tentacle-like structures called "invadopodia" in cancer metastasis. Genetic and pharmacological inhibition of invadopodia entirely blocked cancer spread by stopping extravasation at endothelial junctions. Graphical abstract for the publication: Invadopodia Are Required for Cancer Cell Extravasation and Are a Therapeutic Target for Metastasis, by Leong et, Cell Reports, 2014. Tumor cell extravasation is a key step during cancer metastasis, yet the precise mechanisms that regulate this dynamic process are unclear. We utilized a high-resolution time-lapse intravital imaging approach to visualize the dynamics of cancer cell extravasation in vivo. 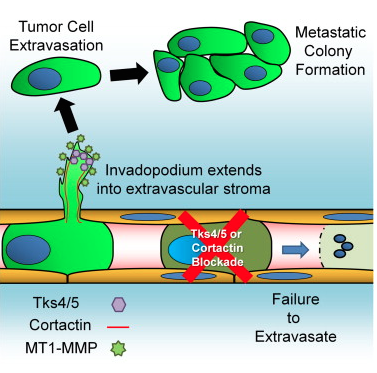 During intravascular migration, cancer cells form protrusive structures identified as invadopodia by their enrichment of MT1-MMP, cortactin, Tks4, and importantly Tks5, which localizes exclusively to invadopodia. Cancer cells extend invadopodia through the endothelium into the extravascular stroma prior to their extravasation at endothelial junctions. Genetic or pharmacological inhibition of invadopodia initiation (cortactin), maturation (Tks5), or function (Tks4) resulted in an abrogation of cancer cell extravasation and metastatic colony formation in an experimental mouse lung metastasis model. This provides direct evidence of a functional role for invadopodia during cancer cell extravasation and distant metastasis and reveals an opportunity for therapeutic intervention in this clinically important process. Scientists have found a way to produce human blood, potentially on an industrial scale — thanks to a certain University of Edinburgh professor, Marc Turner, and his program’s funds from the Wellcome Trust. With this new method, scientists hope they’ll produce a sort of “limitless” supply of type-O red blood cells, free of diseases and able to be transfused into any patient. Blood transfusions are used to replace lost blood after an injury or surgery. According to the National Institutes of Health, every year five million Americans require blood transfusions. A nucleotide analog NS5B polymerase inhibitor was approved by the FDA for treatment of chronic hepatitis C (HCV). It is used for genotypes 1-4, in combination with peginterferon and/or ribavirin. Some of the advantages to previous treatments are: activity against all HCV strains, oral administration, fewer adverse effects than peginterferon, and low probability of develping viral resistance.Notably, patients with genotype 1 or 4 HCV infection had a very high rate of sustained virologic response (90%) at 12 weeks. On December 6, 2013, FDA approved SOVALDI (sofosbuvir) tablets for the treatment of chronic hepatitis C (CHC) infection as a component of a combination antiviral treatment regimen. SOVALDI is the first drug that has demonstrated safety and efficacy to treat certain types of HCV infection without the need for co-administration of interferon. SOVALDI is a hepatitis C virus (HCV) nucleotide analog NS5B polymerase inhibitor indicated for the treatment of chronic hepatitis C (CHC) infection as a component of a combination antiviral treatment regimen. SOVALDI should be used in combination with ribavirin or in combination with pegylated interferon and ribavirin for the treatment of CHC in adults. The recommended regimen and treatment duration for SOVALDI combination therapy is provided in Table 1. SOVALDI in combination with ribavirin for 24 weeks can be considered as a therapeutic option for CHC patients with genotype 1 infection who are ineligible to receive an interferon-based regimen.Treatment decision should be guided by an assessment of the potential benefits and risks for the individual patient.